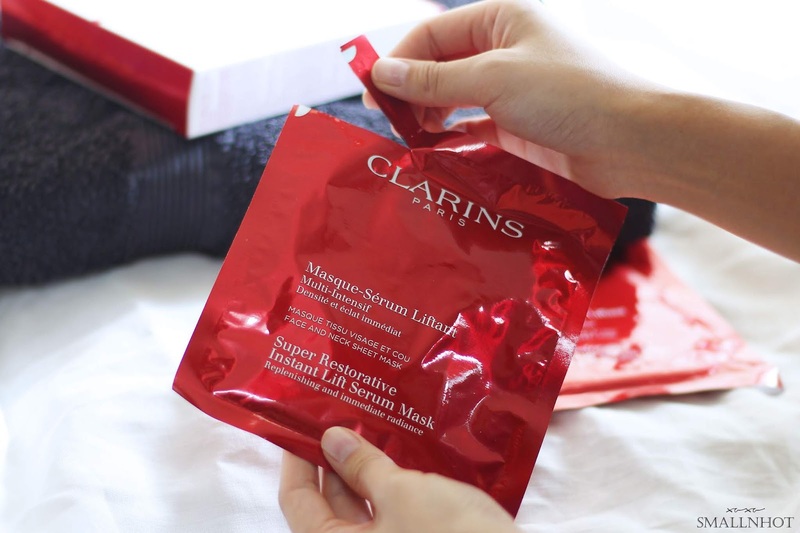 CLARINS Super Restorative Instant Lift Serum Mask : May Just Lift You Up ! After a long week, it's time to throw on a mask and relax. 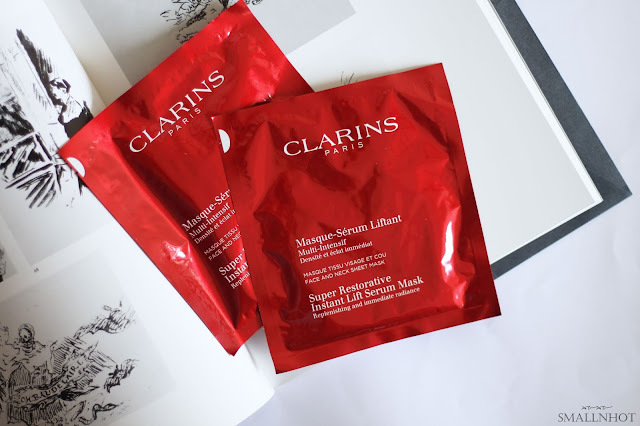 This round it's all about CLARINS' first anti-ageing sheet mask - Super Restorative Instant Lift Serum Mask ! Let me just say that we especially love sheet mask's because it's packed with all the goodness and most importantly travel friendly, lets find out does their first anti-ageing sheet mask live up to their claims of INSTANT LIFT?. You'll LIKE the instant result of plumped and lifted skin. 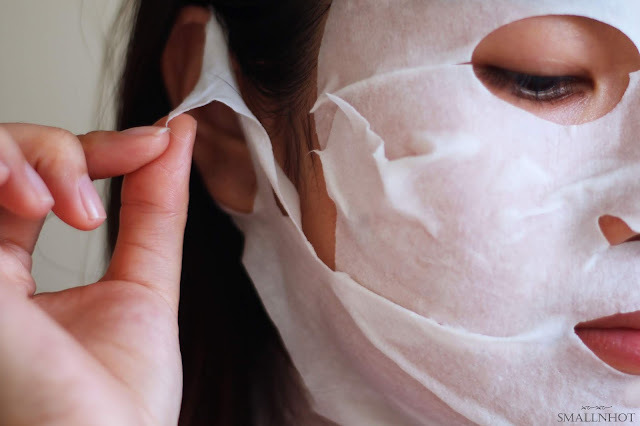 You'll HATE that the sheet mask breaks very easily when you try to tuck it behind your ears. As you open up the packaging, you'll notice that the mask is soaked in just the right amount of serum, not too much that makes it drip all over the place nor too little that you can barely feel any moisture on the mask. First of all, I have to say that the sheet mask is comparatively thick and because it covers from your face to ears and neck, so it can get quite messy in unfolding it. Honestly, the first time using it, I accidentally tore a little of the mask because there's just too many cut-outs. 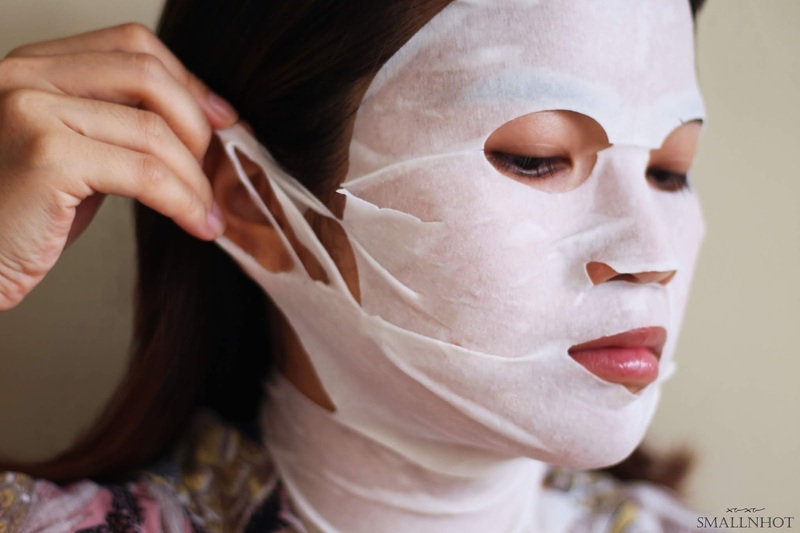 I do appreciate the fact that they are trying to make a sheet mask that covers from head to neck, but maybe the neck part can be separated because I don't see the point of joining it together when it's just a sheet that wraps around your neck. Also do note that the joints of the cutouts where you are suppose to tuck it behind your ears is very thin, it will basically break (as shown in image below) even when you are just pulling it backwards. So don't even try to readjust it. Once you have everything in place, just leave it on for 15 minutes before removing. Your skin will be left feeling plumped up and lifted, especially the cheek area. All in all, I do have to agree with the claims of instant lift. Other than the flimsy cutouts of the sheet mask, this is a great mask to give your skin some TLC, especially after a busy weekend.